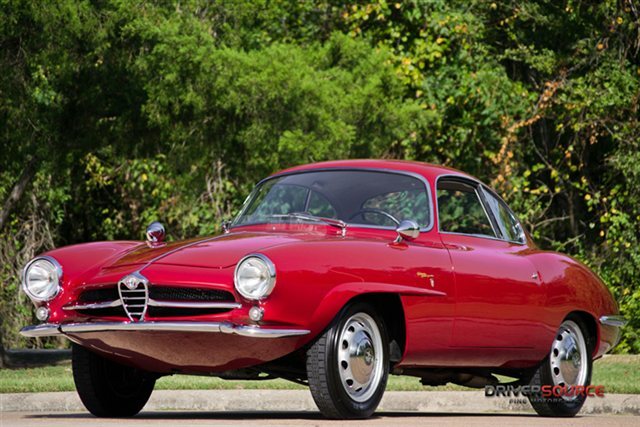 Market 422: Giulietta Sprint Speciale 177251 now at F40 -bring the kids! Update 12/18/12: They always turn up again -this guy at F40 Motorsports. Price of $139,000 is feeling more and more like a sensible high for SS’s and likely the neighborhood they will come to rest in for a while -unless of notable heritage or otherwise interesting. This car has few issues, and if red is you color a trip to Portland CT may be just the thing -though I think the leaves will all have fallen by now. Nicely turned out with Borrani’s. Is it just me or are there a lot of wheel weights on that front wheel? Aren’t the bent ones supposed to go on the back (or get fixed??)? Panel fit is excellent. It’s quite red! Giulietta SS 10120. Henrik sent me a link to this car selling out of Germany, with a note of surprise at the 255,000 Euro price tag. Anyone know which car it is, or have any other pictures? Could be 00001 or 00002 with a grill fitted. I think 00002 is more likely. Update 12/12/12: Numbers added. Thanks Christopher for the fancy footwork. Matching-ish number car = more value, but how much more? Only the early ones seem to have these build plates – usually US cars with the 10117 prefix. 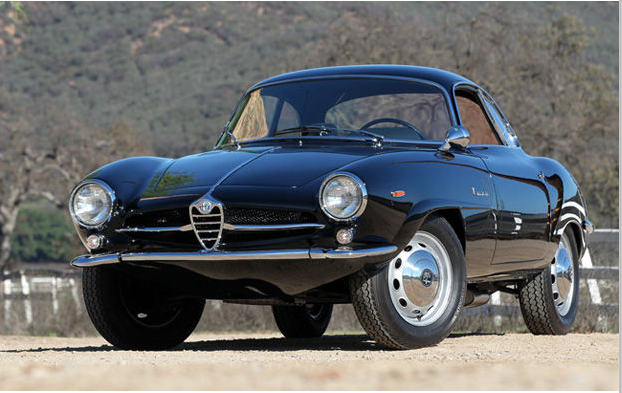 Giulietta Sprint Speciale 10120*00142, 00120*00601. At the bottom of the lower middle of the possibly viable Spring Speciale (typo theirs) spectrum sits this vin-not-disclosed SS out of Beverly Hills. It’s actually more complete than this sort of thing is, but jeez – where’s it been?? Thanks Dan for making me aware of it. Oh – and $44K is the operative range. Everyone needs an SS at the bottom of their pond for the better part of the Rolling Stones career. It is and someone will go for it -it’s just work after all (work being a four letter word for money). Update 12/8/12: Still available. Surprised? Me neither. This is a long uphill slog with a boulder on your back. You would have to be a lucky guy who bought a project that came with an extra cars worth of trim etc. Update 2/12/12: Elmar informs me this car has been relisted by Laurent with a reduced asking price of €8,900. No less a crazy project! French build plate. Positive ID. Someone somewhere will decide this is worth fixing. Eventually. Update 12/12/12: Sale but no sale at $60,000 then sale again at $50,000. If anyone found out the vin, let me know! Giulia SS. This car is on eBay out of Georgia right now. It’s complete ‘original’ and very rough. Bidding has it at $60K. Why have I been waiting for this one? 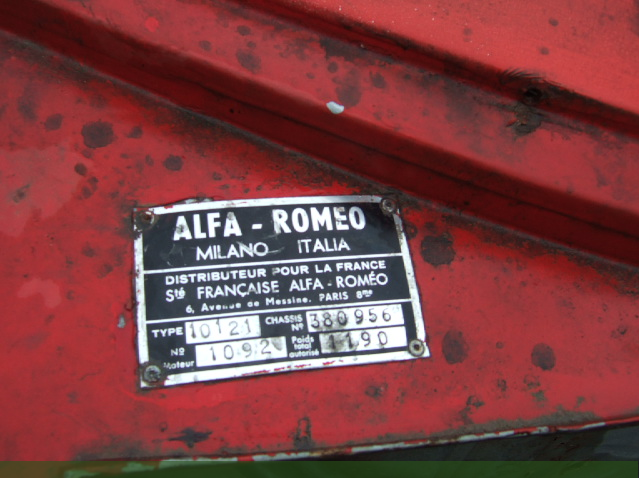 It was posted on the Alfa BB back in 2008 (here and here at least -if you search on other post by Steve, you’ll find more) when I was just starting out with this site. He even started a blog about it. Odd, but I still don’t have the vin number of this car. Check it out. Sweet sweet project. No sign of the rot hat lies beneath. Cool lights up front. Go for it -only about $80K from restored. Market 443: Sprint Speciale 10120 00239 -nice! Update 12/12/12: It sold for $137,500. Can you make this out of a $50,000 project for another $85,000? That’s the gamble I think a lot of guys are taking. 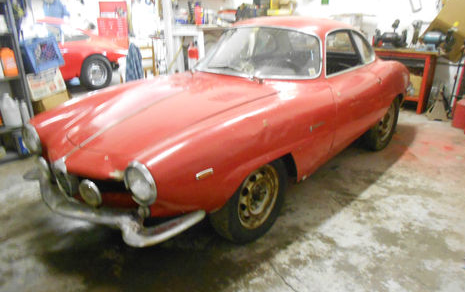 Giulietta Sprint Speciale 10120*00239, 00120*00634. This car is available on eBay from Drivers Source in Houston Tx. They’ve had some Giulietta’s in questionable condition over the time I’ve had this blog, but this one looks pretty good. It has an award in Portofino, so I suppose it’s a recent import. Check it out! “Ruby” red meets foliage. Stance is a litte high. Shine is present and it is what it is. Bumper looks weird -kind of droopy on the ends. $137,500? You tell me.